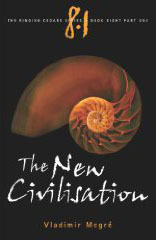 "The New Civilisation", part 1 of the eighth book of the Series, describes another visit by Megre to Anastasia and their son, showing in ever-greater detail how Anastasia s lifestyle of practical cooperation with Nature applies to our lives. Describing how the visions presented in previous volumes have already taken beautiful form to produce massive changes in Russia and beyond, the author discerns the birth of a new civilization. The book also paints a vivid image of a future America in which the conflict between rich and poor has been transcended.